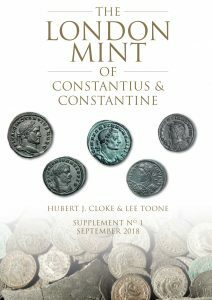 We have just published on the addenda page a downloadable pdf supplement to our 2015 book, The London Mint of Constantius and Constantine (LMCC). The supplement is designed so that users of LMCC can add it to their copies of the book for easy reference. The document, “Supplement No. 1”, follows the A4 format of the book. It includes a number of blank pages to allow for home printing into a booklet of 28 pages when print both sides is selected. The supplement records and illustrates coin types reported since 2015 as well illustrating several types recorded but not illustrated in LMCC. Additions to LMCC previously listed on the addenda page and included in this supplement have been removed. The ‘Corrections’ webpage, however, is still current and will continue to be updated to reflect necessary corrections following the publication of this supplement. We expect that the current “Supplement” will be the first of a series of periodic updates to LMCC. We continue to welcome submissions of newly discovered types and variants to be published on the this site or in future supplements. We wish to thank all of those who contributed to the success of the book and the construction of the supplement.